We have prepared a boycott israel brochure which lists the companies, brands & labels which should be boycotted. 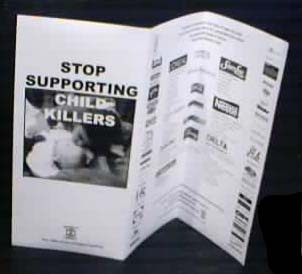 The brochure is small enough to accompany the family on shopping trips, etc., to ensure guilty brands are avoided. The brochure is in Word format. (if you dont have Word 2000 or Word 9 Viewer then click here to download a 300dpi JPEG image [972kb] of the leaflet which you can import in to your favourite dtp or graphic package for printing -remember its designed for A4 landscape at 300dpi or higher - it wont print properly from the browser). Its designed for A4 landscape printing. If you are using american size paper set print setting to "resize to fit paper" before printing. Fold it in to thirds so that it resembles the photo at the top of the page. Please make copies for your family and friends, and to distribute in your local mosque.